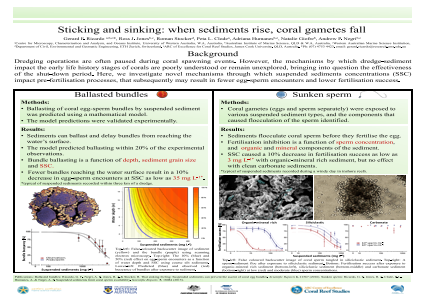 Abstract: Sediments can impact the reproduction and developmental stages of coral and therefore threaten the resilience and recovery of reefs following disturbances. In a series of controlled experiments, we examined how suspended sediments typical of dredging operations may affect the ascent of coral egg-sperm bundles and impede fertilisation on the water’s surface. We reveal that sediment grains can ballast and delay the ascent of egg-sperm bundles during spawning, and quantitatively model scenarios to predict the conditions that cause ballasting, and the subsequent reduction in egg-sperm encounter rates. Next, we reveal that successfully surfaced gametes are also threatened by sediment exposure due to sperm-limitation. Using multiple lines of evidence, we propose that the formation of sediment-sperm flocs is the primary mechanism responsible for a decrease in fertilisation success during sediment exposure, and detail the conditions that trigger this mechanism. This research forms part of a broader question of how sediments impact the early life history stages of corals and quantification of each of these interactions are improving our understanding of the risks that sediments from dredging, river plumes and resuspension pose, allowing for improved management around these events. Summary: A mechanistic approach to how coral gametes often lose against sediment exposure.References: Ricardo, G. F., Jones, R. J., Clode, P. L., Humanes, A. & Negri, A. P. Suspended sediments limit coral sperm availability. Scientific Reports 5, 18084 (2015).